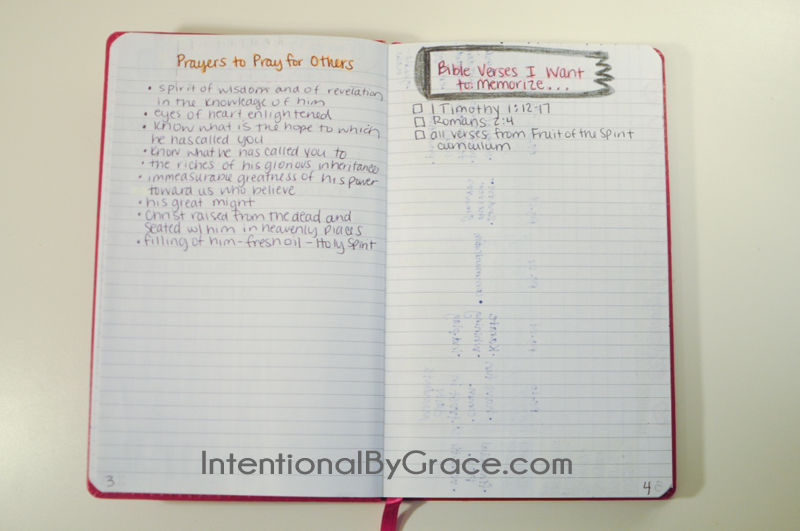 Have you ever considered creating a prayer journal? 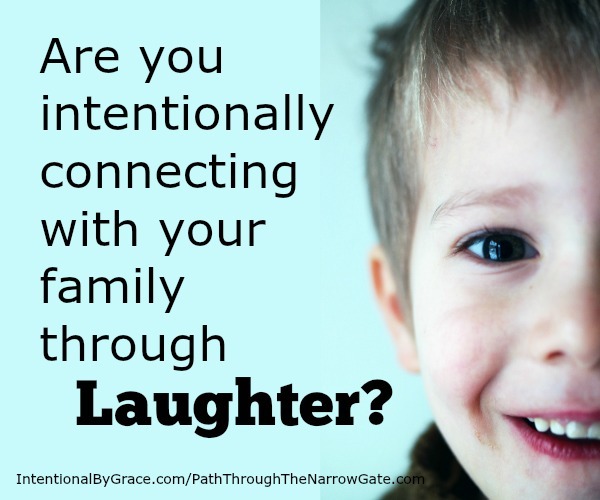 Do you want to be more intentional with your prayer life? Then today’s post is for you! I have wanted to share my new prayer journal for several weeks now, but life kept happening and shooting the video kept getting pushed down further and further on the list. But thanks to wonderful grandparents who love our kids, for a week free of sickness, and a clean house to boot, I was able to set aside some time this week to record a brief walk through of my brand new prayer journal. Woohoo! I shared how to make a prayer notebook last year and that post has really encouraged many of you on to create your own prayer notebook. But some of you said that you wished you could figure out how to make a prayer journal instead of a prayer notebook. To be honest, I was right there with you, but I was more concerned with getting my prayer life in order and growing in the discipline of prayer rather than getting the perfect system. 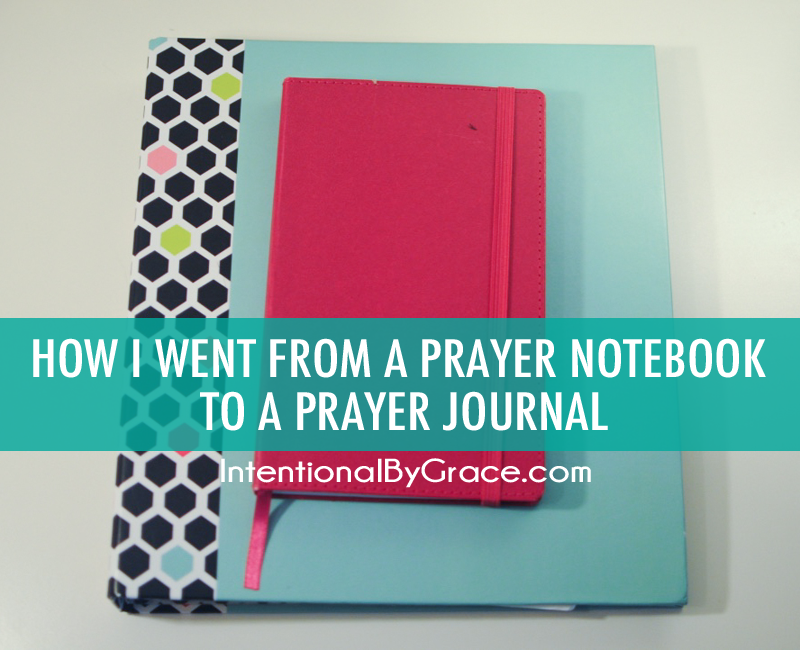 I started with what I had and the prayer notebook was such a helpful tool for me! With the help of my prayer notebook, I definitely grew in my prayer life and disciplined study of God’s word. The tabs in my notebook helped guide my prayers and kept me from merely shooting “genie in a bottle” prayers up to God or at least guarded against only praying for my needs and worries of the day. I began the process of writing out prayers as I read God’s word, and all in all, I was very pleased with my prayer notebook and how God used it to grow my prayer life in general. But like many of you, I still wished for a prayer journal. I missed my journals. I’m a journal keeper and have mounds of them piled in my closet as memories and testimonies of God’s faithfulness. The notebook just didn’t have the same effect for me. Then, I discovered the Bullet Journal® method of planning, a method of planning created by Ryder Carroll (read more about it here), and it was through this process that my wheels started spinning. 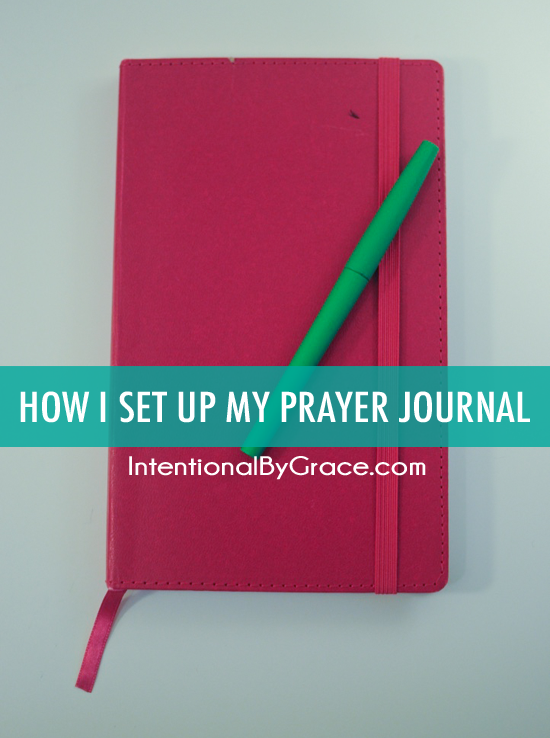 What if I used what I learned from setting up my Bullet Journal® and from my year of using my prayer notebook and created a brand new prayer journal? So, I bought a new journal and … stared at it for several weeks. I thought about how I could translate my prayer notebook into more of a journal format. I kept using my Bullet Journal® to plan my days and let the prayer journal idea spin on the Ferris wheel of my mind. My prayer journal uses all the same concepts and ideas from my prayer notebook, but simplifies it down into a small journal that I can throw in my purse and carry with me to church or small group or even curl up in the bed at night and write out prayers God has laid on my heart throughout the day. I have been using this journal for several weeks now and though the process is still very new, and will likely evolve as I go, I am very pleased with how it is going. 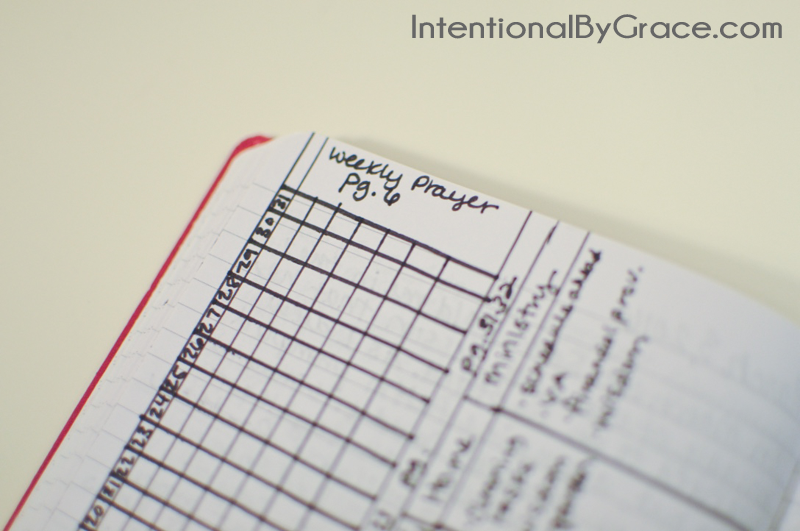 If you haven’t read my post about how to create a prayer notebook, then it might be a good idea to check it out before viewing my new prayer journal. After creating a Bullet Journal®, I decided to stick with the same journal style because I knew it worked for me! I opted for a cheap classic journal from Walmart. It has 240 ruled pages, an elastic band, and a ribbon marker. Note: I highly recommend choosing a journal with an elastic band. It keeps my journal nice and tight, allowing it to go places with me without feeling too bulky. I keep church bulletins and study guides tucked in as well so the band just ensures nothing falls out. Oh, and I can attach a pen to the band which just makes sitting down even easier. 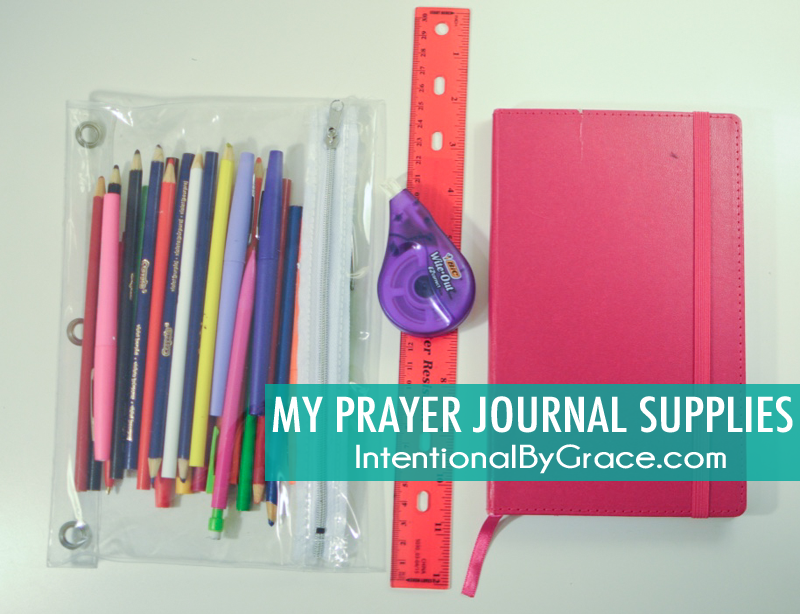 Because I use my prayer journal alongside my Bullet Journal®, I have a cheap, clear pencil bag from the dollar store nearby at all times. I happen to like journaling with pretty pens, these to be exact (they don’t bleed), and the pencil bag keeps it all together for me. As I got into the Bullet Journal® method of planning, I found colored pencils to be a fun way to spruce up my lists when I needed some relaxing, therapy time. So, the pencil bag holds those as well. I find doodling therapeutic during prayer and Bible study when I’m thinking deeply on something. It just helps keep my mind focused. Finally, I keep some wite-out EZcorrect tape in the bag because I make mistakes a lot. This allows me to quickly correct them without having to start all over again with one of my prayer pages. Oh, and every once in a while I need a ruler because I create my own daily prayer tracking calendar. I just keep this on my desk and pull it out as I need it each month. 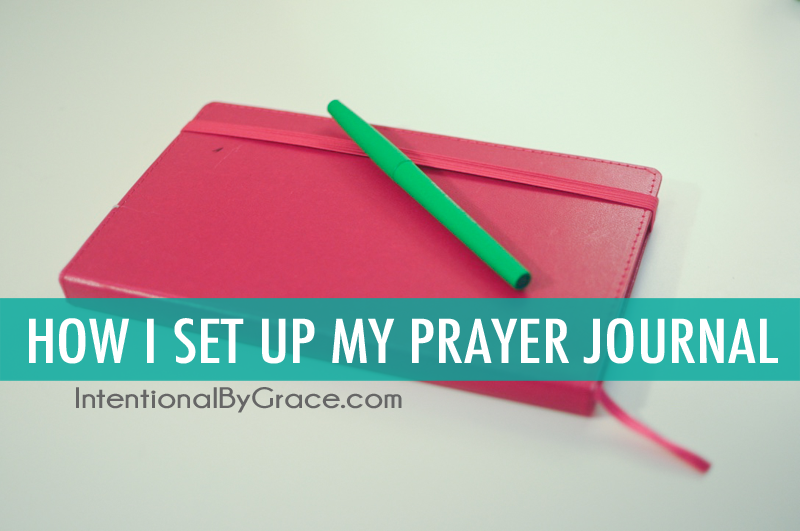 The basics you need to get started with your prayer journal is a journal and a pen. That’s it. The rest you’ll discover as you go because you’ll learn what you like and don’t like. If you want to see inside my prayer journal, click here to watch the video on YouTube or just press play below. Below the video, I will explain some of the main features that made it possible to create more of a journal rather than using a 3-ring notebook. But watch the video first so you can get a good feel for what I’m talking about. The Index feature was the game changer for me when I started my Bullet Journal®. It was the index that made me think that I could create a prayer journal that fit my needs while not sacrificing everything I had learned from my prayer notebook. By giving each of my pages in my journal a page number, I can now keep track of where all of my prayers are located. This means on Friday, I know I can turn to page 31 to begin praying for our ministry. 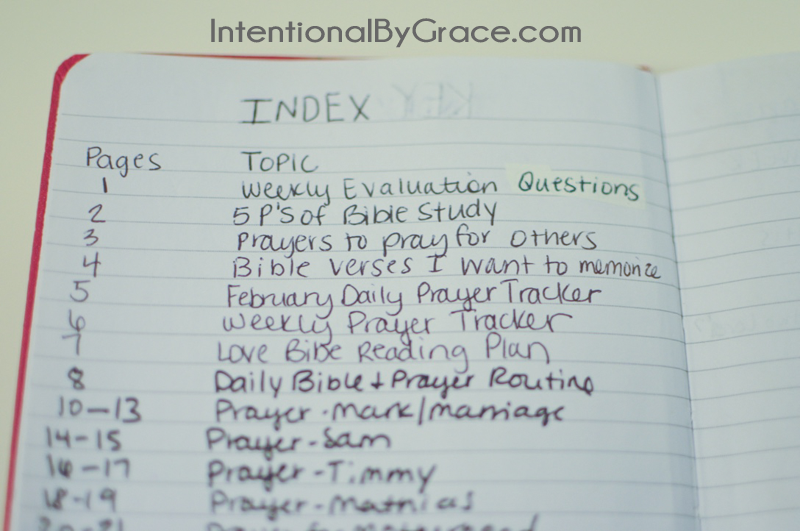 I can also keep track of my Bible reading plans, sermon notes, and weekly evaluation questions simply by looking at my index and flipping to the page I need. This has made all the difference in the world! The tabs in my prayer notebook were what helped me to grow in the discipline of praying regularly for others in my life. It was the tabs and the categories that allowed me to organize all those prayer requests I receive into a system that helped me to remember to actually pray. So, I had to figure out how to translate this into a journal, and this is what I came up with. 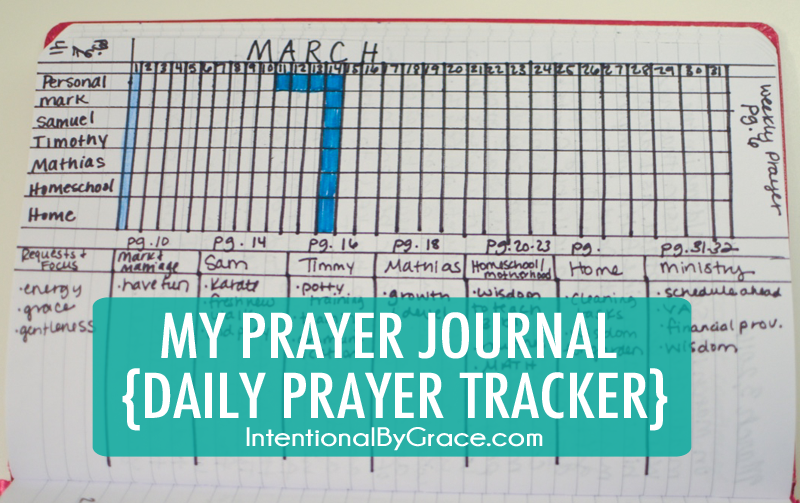 Each month, I set up a daily prayer tracker. There are two main sections to this part of my prayer journal. At the top I write the month and then make a grid for the number of days in the month. 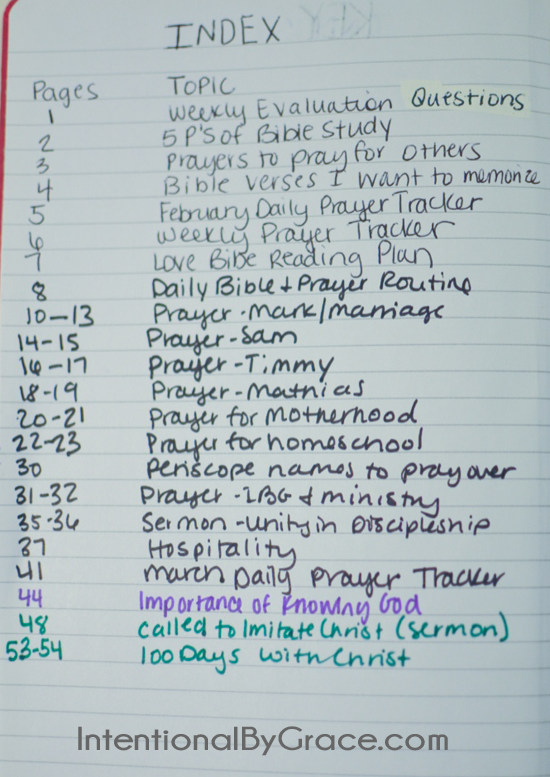 Along the left hand column I write down the categories of my daily prayers – Self, Husband, Children, Home, and Homeschool. Those are things I pray for daily. Then, I simply color in the box as I pray (or not …). Sometimes I pray as I go about my morning routine because my prayer time got interrupted which means I don’t color in the box. But the guide is still there for me to see and prompt me as I need it. On the bottom half of the spread, I list across the top row the same categories from above. This allows me to collect specific prayer requests and needs for each of these categories for the month. Sometimes this changes from month to month, other times it stays the same. But usually it reflects whatever the Lord has laid on my heart to pray specifically for each of these people and areas of my life during my Bible reading time. Finally, I want to note that I also tell myself what page number my Weekly Prayer Tracker can be found. 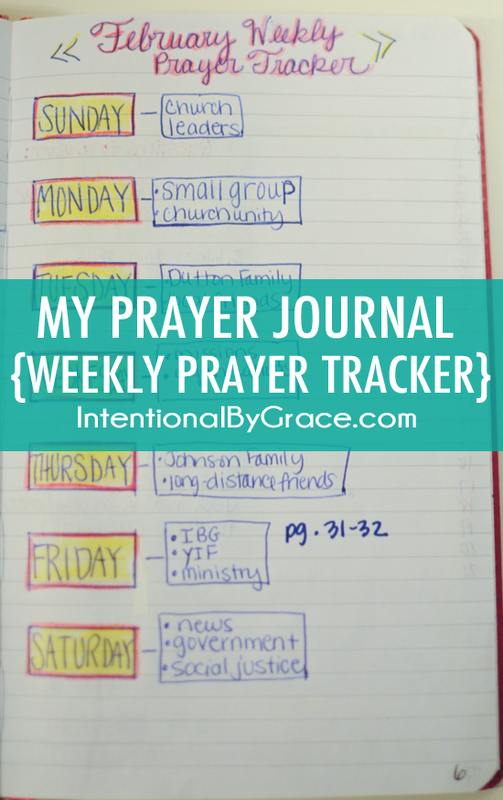 When I’m done praying my daily prayers, I can flip on over to my Weekly Prayer list. Collections are for the random things I like to keep lists of and allows me to put them in my journal and not lose them. Here are some of my collections that I’ve been able to index and find again later as I need them. We love memorizing scripture together as a family. We’ve now started trying to memorize whole passages together, and I keep a running list of passages that I want us to memorize together here. These are passages I come across in my daily quiet times or hear other families recommending. As I’m studying my Bible, I might come across passages that are great to pray for others. I love praying scripture over my family and friends, and this is where I can keep track of ideas and passages that I find. So, when I write out my prayers, I have some great Bible passages to refer to. In the mornings, I’m groggy. I can’t think straight and I forget what I’m supposed to be doing. So, I wrote out my daily Bible and prayer routine with prompts and questions to help me get through my Bible study and prayer time with purpose. I don’t always refer to this page, but it’s here when I need it. I especially like it when I’m starting a new book of the Bible because it has five essential questions I want to be sure to answer before starting as well as a guide for praying with purpose. If you’re interested in my current method of studying, then you’ll want to read this book. It’s hands down the best book I’ve read so far on the topic of Bible study. I like having a daily checklist for my Bible reading. Breaking down passages into smaller chunks ahead of time or creating a topical Bible reading plan helps me to stay motivated and engaged in my Bible time. Having a plan goes a long way in keeping me motivated; plus it ensures I’m not just hopping around God’s word trying to chase every worry and fear. Instead, I can approach God’s word as a way to know Him and allow Him to speak through His word. I’m sure this process will evolve as I go. 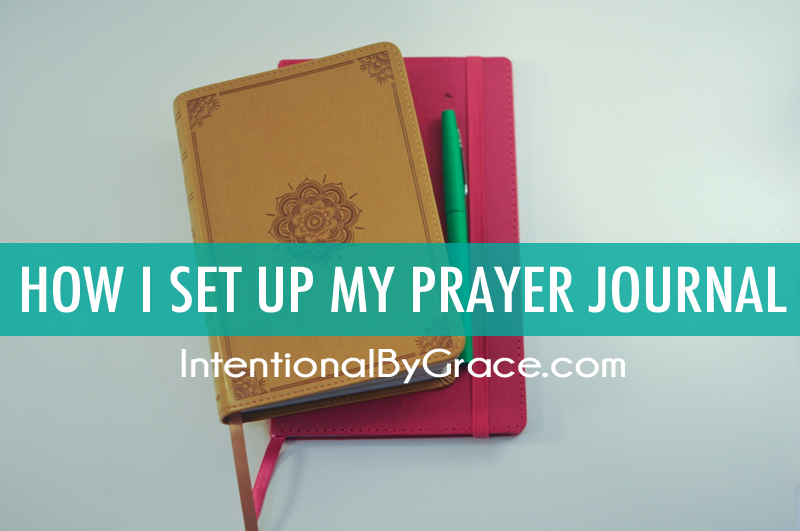 As I mentioned at the beginning of this post, this prayer journal is still very new to me, but I’m adding to it here and there and praying for the Lord to lead me deeper into His word and the discipline of prayer with this as a tool. Since creating my prayer notebook, I’ve begun to write out my prayers instead of keeping a running prayer list. I quickly learned that writing out a recurring prayer for the daily and weekly prayers that I want to pray has really helped me to pray more scripture-based prayers and with more intention overall. Again, writing out my prayers helps me to not just pray a laundry list of needs, but true grace and God’s word over my family and friends. I haven’t written out a prayer for each of my weekly prayer categories yet, but as time allows and the Lord gives words, I will add to my journal. Maybe I’ll share some sample prayers to get you started in the future. We’ll see! This prayer journal has really been an incredible process of learning for me. I love that I didn’t totally scrap the prayer notebook I created last year, I just tweaked and simplified it into more of a journal format. I could not be more pleased! I look forward to seeing how the Lord uses it in my life to grow me in the discipline of prayer. What a gift of grace! What about you? 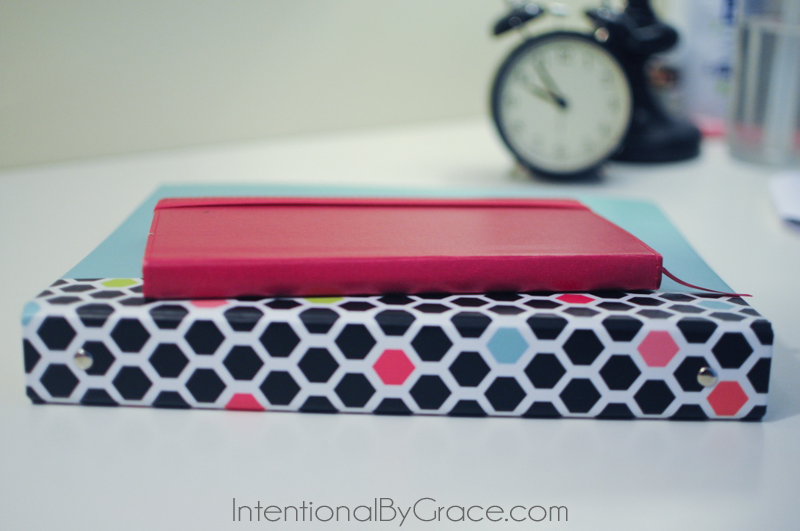 Do you have a prayer journal? I would love to hear more about it! I started laughing when I saw the title of the email. I knew it–that you BuJo’d your prayer notebook! I did the same thing this week, only a tad different (I used tabs on the top of the pages for better indexing and a lovely composition book) and I kept my Bible studies in my prayer notebook. My prayer journal will stay next to my bed for my nightly prayer time (easier for me with a hubs who works nights), and the notebook is down at my desk for mornings. I have a space in my BuJo for any requests that come up that I can transfer to my actual prayer journal at the end of the day. A garden journal is on my list … we’re crazy! haha! I love that you keep a spot in your Bullet Journal for prayer requests. That’s a great idea! Wow!! You are dedicated to your prayer life!! I really like how organized you are in your prayers. For me, I’m lucky if I can get a few random prayers in here and there throughout the day. I don’t know if I could stay as dedicated as you are but it would be interesting to try! This is why I created a prayer notebook/journal. I was tired of not praying. 🙂 Just pray and ask God steps you can take to be more disciplined and faithful in prayer. It’s all of His grace! I’ve been eagerly awaiting this post Leanne! The notebook has been serving me well the last couple months, but I’ve found the same limitations as you mentioned – wanting to sit on the couch with a kid (or two or three) as they watched a morning video, but the binder is too bulky. I think I’ll keep at the binder method for a while yet just to practice consistency and not not the perfect method but will definately be considering this in the near future! Thanks for sharing your brain work!! 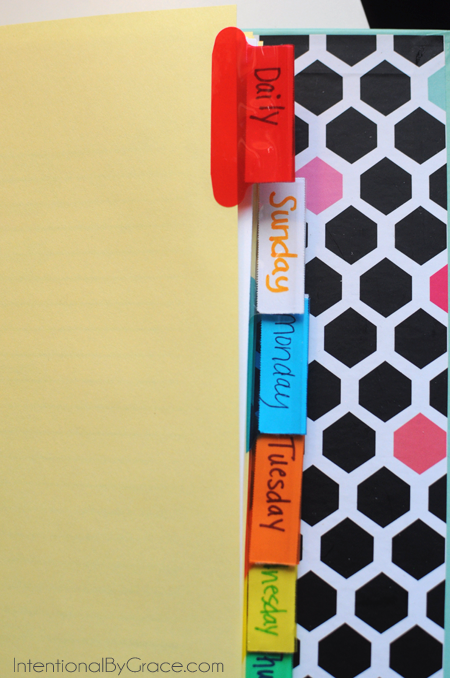 I have a Erin Condren Life Planner for my appointments, chores, and routines. I list my weekly chores by category and love it so that I am not writing tasks on a specific day, and then having to carry them forward each day. It’s working really well for this “never satisfied with a planner” gal. But I love the idea of a Bullet Journal and have tried them in the past – I just never was able to stick with it. But my EC doesn’t have room for all the “collections” and lists that I need. I have now made a “Collections” Bullet Journal, with none of the “planning” things but all of the “listing” things. I have added my prayer journal, bible reading ideas, sermon notes, great quotes, gardening ideas, blog post ideas, birthday party ideas, bible verses that encourage me, books to read and all the miscellaneous scraps of paper with important information all in one bullet journal!! I love having all my thoughts in one place, now whenever I have a thought – it’s with me and I can write it down. I have dabbled with doodling around the edges, and I have used many of your ideas for pages. Thanks so much for the inspiration!! This is what I have found is the perfect mix of the two!! I have my Erin Condren as my planner, a “BuJo” for my lists/collections, and after this post (thank you Pinterest for finding me my new favorite blog!!) I am going to make a BuJo prayer journal too!! Yay!!!! I am so thankful for you in my life! The Lord uses you Leanne! I am so excited to get started! I have read Jen Wilkens book and I wanted a way to help me remember and to follow through. Along with remembering what and who to pray for! I am a new mom (I have a 2 month old) and this will make my brain stay focused when I am in zombie mode!! Thank you for being faithful to your readers! It truely is minstry to me!! This was a great post! I have a prayer journal but mine is housed in my spiritual traveler’s notebook. So I have different inserts for each category. I have inserts for scripture writing, Bible studies (I currently follow the Good Morning Girls studies), a prayer journal, and a gratitude journal. I also bullet journal so I love the way you have set up the trackers to help with your prayers! I may try to incorporate this! Thanks for sharing! Thank you SO SO MUCH for this post; I have only recently come across your website and I’m loving it – it’s so encouraging and practical. I had read your prayer notebook post and had found it a little overwhelming – I was procrastinating over it while working through the Living for Him and Planning 101 information when you posted this. Hurray!!! I’ve just had the most productive (and FUN) morning putting my prayer journal together with all the notes and scribbles I’d gathered together and it’s really helped to clarify my thoughts. I’m sure it will enable me to enjoy a more productive and disciplined prayer life and will evolve as I use it. Thanks so much, Leigh Ann!!! Keep up the good work! I have set up my new prayer journal! If you’d like you can view it on my last blog post! I gave you credit where it was due! ???? Thank you for sharing! This is fantastic. Been thinking about how to do it. Such a great idea! I started bullet journaling in February, and I LOVE it! Not gonna lie–I’m kind of obsessed with it. 😉 I’ve been trying to figure out a way to include prayer requests, and I really like how you’ve used the bujo method as a prayer journal. I will probably be using some of your ideas! I have been wanting some MORE for my quiet times and just noticed this past weekend my friend with her little journal always taking notes. 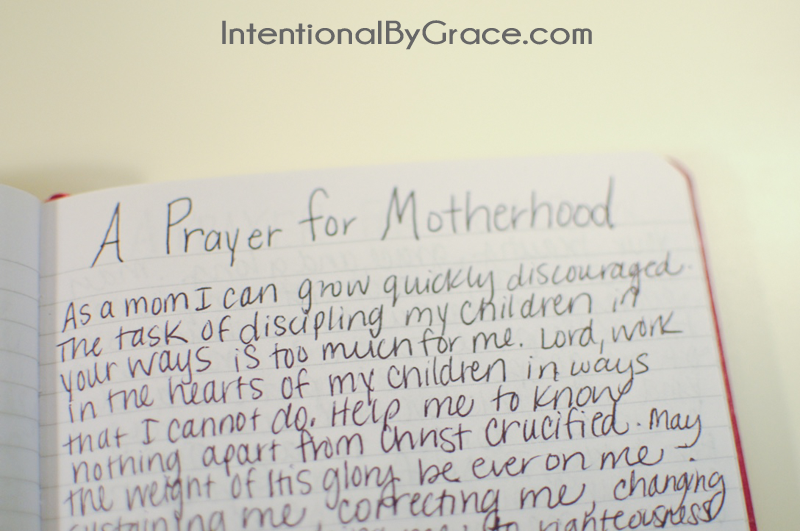 I have been journaling for sometime in the mornings with God but am finding repeating my daily prayers inefficient – I love that you have specific written prayers for family. I am working on praying out loud more and less journaling every single thing. Anyways, I just happened upon this post and I am so excited- I have my little cheap-o journal myself now (and it happens to be in purple, my fav!) and I am looking forward to being more intentional myself. Thank you for taking the time to lay all of this out. Have a wonderful week Leigh Ann! I love that you have done this! I bought a new journal last month especially to BuJo my prayer journal and I have been researching ways of combining the two! Thanks so much for your inspiration! I adore your structure! You may already know this and if it’s been mentioned my apologies but they do make stick on tabs that could be used in journals. That’s the route I’m going because I like the portability of a journal as well but it’s much faster for me to just go to a tab. They also do make some binder style journals (you can find them on amazon). they’re journal size but you can add and remove pages. this is great for when you’re not sure how much room you’ll need for a given topic. Great ideas here. I’m really blessed to have found this site. Loved this post! My prayer strategy changes all the time. Its important to stay on track and pray for others. Thanks for sharing I’m going to have to try this out. This is such a great post! I just started a bullet journal a few months ago and was searching for ideas on how to incorporate some pages to keep track of my prayers. But now I totally want to start a separate prayer journal! I’m so glad I found your site! I just want to say thank you. As I have returned to good I’ve struggled with being consistent and feared I’d fall by the wayside again and just give up. I’d staring using a bullet journal in the rest of my life and when I found this from you it was a Eureka moment. My prayer life and bible study has now been consistent for over two weeks and I can’t thank you enough. God bless you for this! Wonderful news! I’m so glad this was helpful for you! I just looked through your posts on both the prayer notebook and journal. I have always loved the flexibility of binders, but the manageability of journals. Therefore several years ago I switched to the much smaller binders (approx. 7” x 9” x 1 1/2”). I found mine in Staples and Office Max, but are readily available on Amazon as well. Just thought I’d throw that out there. Thanks for all your hard work and sharing of ideas. 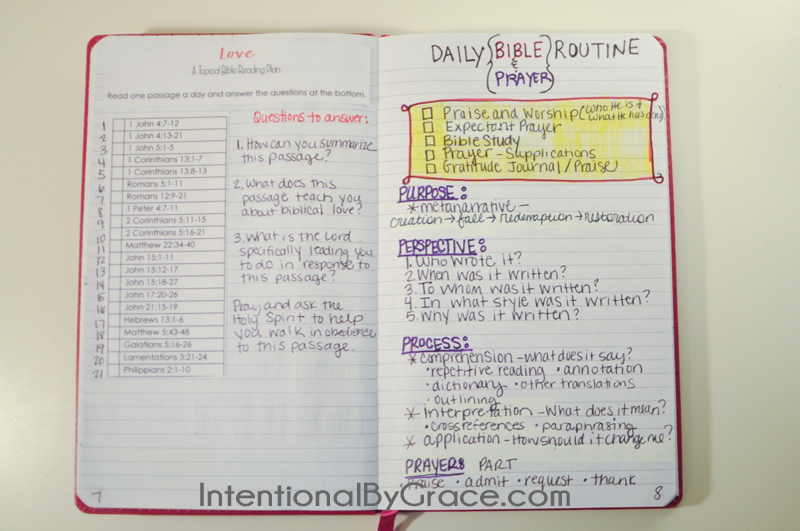 Thanks Leigh Ann – I am inspired to move to a prayer journal. I did start a prayer notebook based upon your notebook, but am now looking forward to starting more of a journal style. Here’s my question to you though…How do you fit it all in?! Bible Study, Prayer Journaling, Reading…I do have a full time job outside the home, 4 children (24 at home, 21 away a college, 17 at home, 9 at home). I have about 40 minutes each morning before everyone else gets up for my quiet time. It just flies by! I just don’t know how to “schedule” all the elements of my faith walk and growth into each day. HELP! Suggestions on how to get it all done would be welcome! If you have to add more entries into your index, it doesn’t look like you have enough room on that line. For example, if you later decide to add additional prayers for any of the people referenced in your Index page, there doesn’t seem to be enough room to add additional page #s. Am I formulating my question correctly? Just wondering if you do make additions for expansion…? I’m not 100% sure I understand your quesiton, but I do know that I’ve always had enough room in my index. I’m not sure if this is what you’re asking, but I’ll use an example. Let’s say I add a prayer for my daughter to the next blank section in my journal. I look at my index, and I see that I have one already for her on pages 18-19. I write my prayer for her on page 170. Here’s what I do: 1) I record 170 – Prayer for Daughter in my index. 2) On page 170, beside the page number, I write “< -pgs 18-19". This tells me there is another prayer for her on pages 18-19. 3) On pages 18-19, I write "-> pg 170″. This tells me that there is another prayer for her on page 170 that I can reference. I’m not sure if that answers your question, or not. My index is just a running list of the page numbers, which really should be in order just like a Table of Contents. If I do happen to run out of room, I will use the same arrow system at the bottom and tell myself what page the index continues (my plan is to start in the back of the journal, if ever I run out of index space). Thank you so much for sharing with us! God bless you! I love this so much! Thank you so much for sharing! 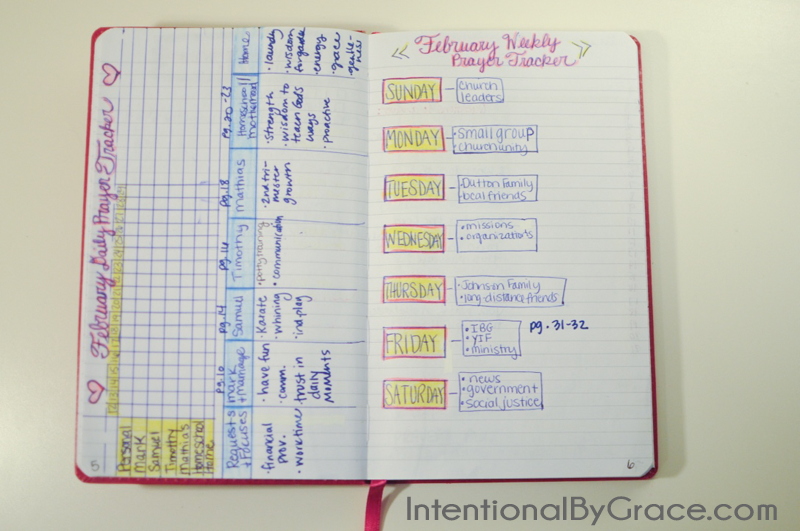 I’ve been looking for a way to organize my prayer life for a long time! I like part of one method and something else from another… this puts it all together for me! One thing I have enjoyed and may add to this method is a month view. I’ve been carrying around a yearly planner and when someone asks me to pray for a specific event, a surgery, travel, a situation (or whatever), I write it on the specific day it’s happening that month. It’s been really helpful to me in remembering to pray for that thing. I assume you would include that information within another part or section of your journal, so how do you incorporate that? I apologize if I missed that part of your video. Oh that’s a good idea! I hadn’t even thought of it being in my journal. I honestly just add it to my master calendar. I use my phone for that. When I see, I pray. Our ladies ministry group wants to offer a devotion notebook because we have several young ladies and others that we think this would be great. Any help is appreciated and printables.